Ok, I am still super happy with this dress that I made, and I can’t wait any longer to post it. As you may recall, I was invited to a (most excellent and absolutely lovely) wedding in June. My fourth wedding ever, and third in recent memory, I was determined to wear something other than my standard blue dress which was bought several years ago, was always mildly large up top, and is now in danger of crossing into “indecent exposure” territory. Of course, I had originally planned to make Simplicity 4014, but as previous blog postings will show, that was a failure of epic proportions. In addition, since I had needed to re-make my figure dress for this year (yet another project post to come), I was behind schedule in terms of finishing projects for all of the June events I was attending. So, after the failure that was Simplicity 4014, I madly rummaged through my fabric and pattern stash and decided to take a gamble on BurdaStyle 04-2011-109. BS 04-2011-109 the line drawing on the right. I had just barely enough to make the dress. 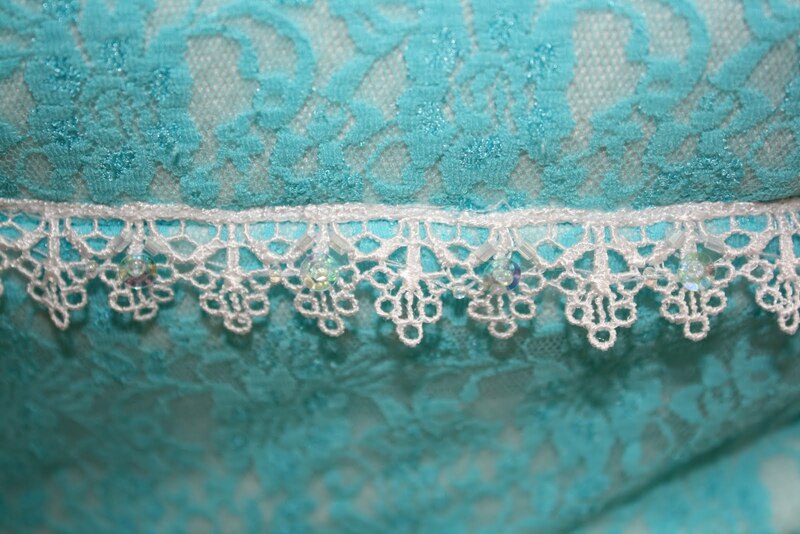 I used 2 layers of white stretch cotton under the lace. The top layer is thick and textured, the bottom layer is very thin and acts as a lining. I am always suspicious of white, so I figured I was better safe than sorry with the layering. The dress was a bit heavy, but since it was cotton, it wasn’t too hot. I also got some trim from JoAnn’s to add to the dress. I have never been able to wear a dress in this style before, because I could never find one that fits. I also don’t usually wear “trendy” clothes, but I think the lace and color move this dress into the trendy category. Strange to even be pondering how well my dress fits with current fashion trends, because usually I don’t care, but in a way it is sort of exciting to make clothes that could be deemed “fashionable” I guess. But the form helped with the crazy swayback fitting. Actually, the zip is really good, except where the trim adds bulk. I really like my trim though, so it is forgiven for messing up the zipper. 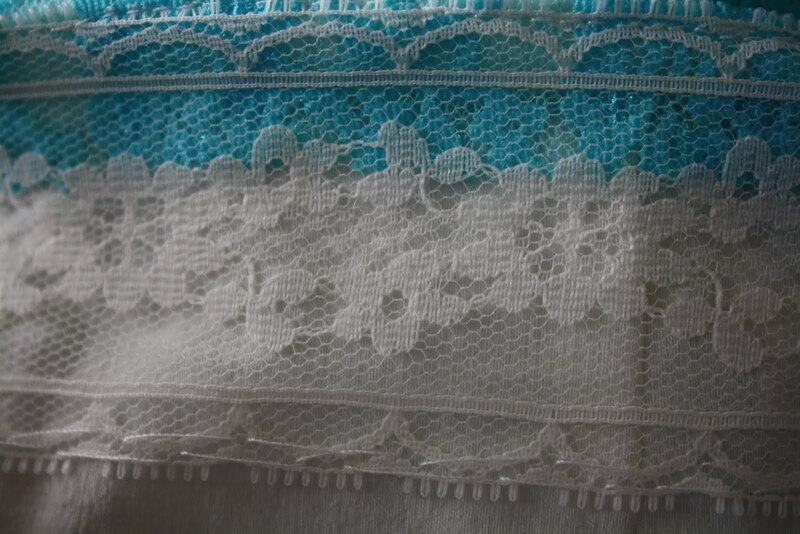 I used lace trim to do an invisible hem – stitched by hand to the white cotton lining. And, as an added bonus, I got pictures of it actually being worn! The front – super happy with the fit on the top. The back – still a bit wrinkly, but not anywhere near as bad as most RTW. I am super happy with this dress. It looks a bit wrinkly in the person photos, but part of that is because I took them after sitting for a while, and part is the super high contrast from the very sunny day. In real life the seams are pretty smooth (like the dress form pictures) but it is hard to tell from these pictures because the dress form is a tiny bit too big, which makes the dress gape and wrinkle where I can’t close it all the way. In either case, it is super comfy to wear and I love it. So now, the official review! 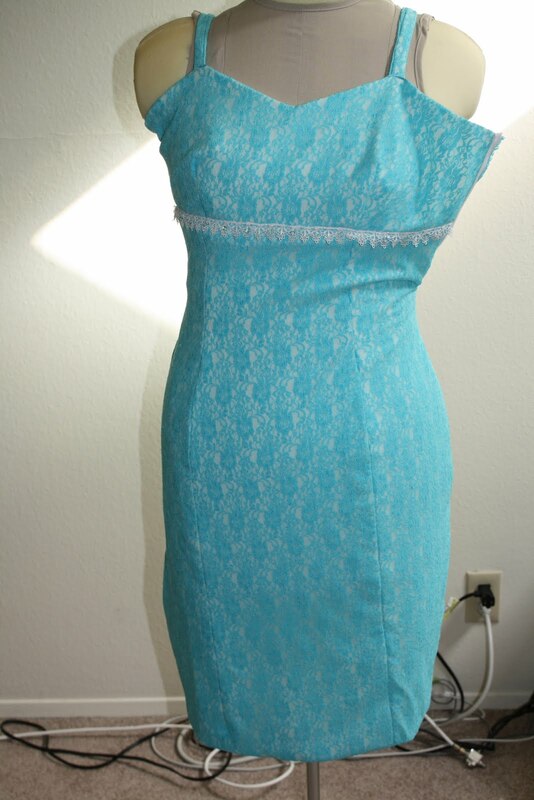 Pattern Description: Fitted sheath dress. Pattern Sizing: Burda sizes 36 – 44. I used a size 40 up top, and graded out to a size 44 around my thighs. Were the instructions easy to follow? I thought so. I know a lot of people don’t like Burda instructions, but I thought these were pretty decent. Of course, it helped that the pattern was super simple as well. Did it look like the photo/drawing on the envelop once you were done with it? Difficult to tell, since the photo of the dress is covered by an outer dress, but I thought it looked a lot like the line drawing. I added trim under the bust instead of along the top of the dress, however. What did you particularly like or dislike about the pattern? I love the fact that the pattern is so easy to put together. It doesn’t use a lot of fabric, and the number and location of the seam lines make it very easy to fit to a body. It is a basic pattern that can be made up in a lot of different fabrics to get totally different looks. No dislikes. 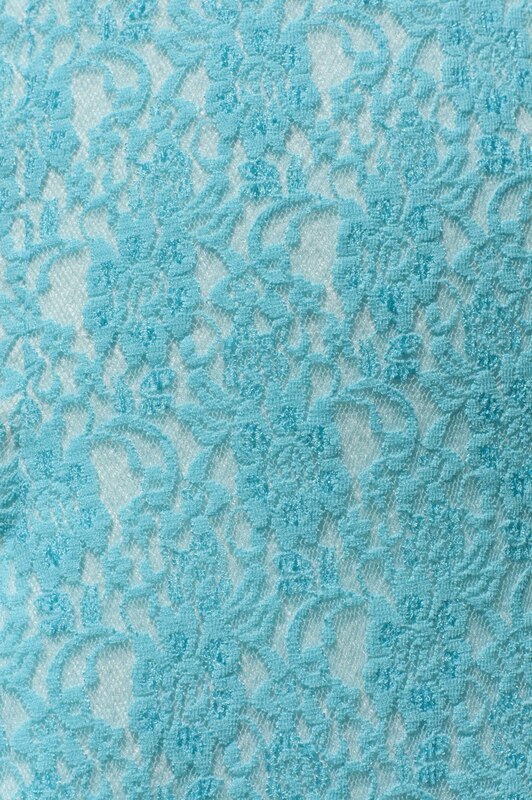 Fabric used: Stretch lace lined with stretch cotton. 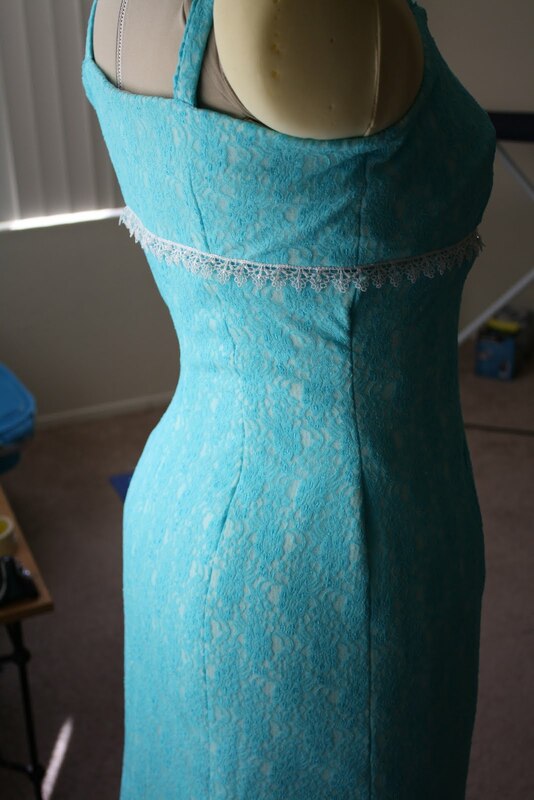 Pattern alterations or any design changes you made: I added trim at the seam under the bust. I also added a lining because of using the lace material. I had to do a 1.5″ swayback adjustment, and I needed to raise the top because it was very low (just the way Burda likes it). I did that by adding an inch at the full bust point so that it would give more coverage. I also raised the area under the arms by about 1/4″ so it would fully cover my undergarments. I also added 2″ of length to the waist area. These are my usual adjustments for most patterns (in terms of adding length), so I think this pattern is well drafted. Would you sew it again? Would you recommend it to others? I want to make this again! I got some purple stretch taffeta that I want to use for this pattern. This may become one of my first TNT patterns, I love it that much. Conclusion: Love this pattern! Because of all the seam lines, it is very easy to fit to your body and make it look good. 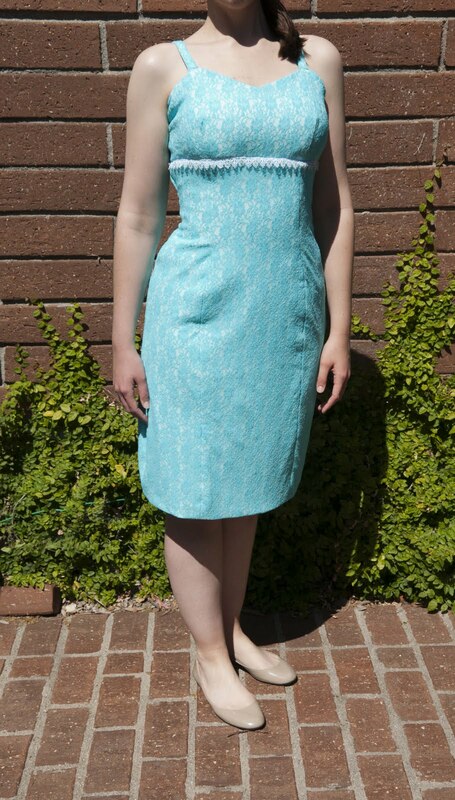 Simple to make with pretty good instructions for Burda. Since the design is so simple, the fabric can really determine if it will be a simple day dress or a special party dress. It wasn’t one that I was immediately drawn to in the magazine, but I am very happy I tried it out. So yeah, not too much in the official review, because the pattern really was a joy to make, and I love the results. Total satisfaction. Coming up next: a review of my coat, in which the results are a little less satisfactory. I had completely discounted this pattern as just an undergarment. Thanks for opening my eyes! You should be happy, that's a beautiful dress.